Hello friends! I hope everyone is having a good week! What a glorious Spring week we have been having here in Cleveland. It's 72 and Sunny here today. Wow!!! That just never happens so I have been enjoying every moment. I wanted to provide a Baby #2 update since I just returned from my weekly doctor's appointment. The sad news is, is that I have nothing to report!! Praise God he is doing well, just a little too comfy at the moment it sounds like. I am still 2 centimeters and 50% effaced. Today is my last day in the office which is quite bittersweet for me. It just hasn't set in yet that I will not be returning to a Corporate office for a VERY long time. My decision to become a SAHM feels good, it's just going to take some getting used to after all this time!!! I am so lucky that we are able to do it and really looking forward to the next chapter in my life. At this point, I am just playing things day by day. My doctor does not sound like he is in any hurry to induce me since Jillian came on her own so it's just one big waiting game for now. My next appointment is next Thursday, March 22nd, in which we talk induction at that time. So do you get excited for March Madness?? I know I do. A big shout out to Ohio State who I have going in the championship game!!!!! Woohoo!! I participate every year in a bracket pool and am really excited about this years tournament. I actually take my brackets pretty seriously and put time and effort into the researching of low risk upsets. It's paid off for me in the past so I am hoping this year will be just as fun and exciting! 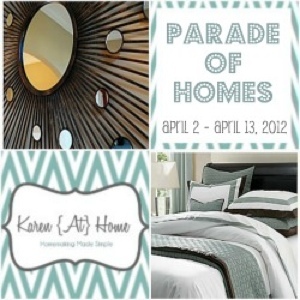 Just a reminder that the first Karen At Home Parade of Homes Tour begins on Monday, April 2nd!!! We have a lot of beautiful homes to show off and I couldn't be more excited. My main goal for this parade of homes tour is for me to take a little bloggy break since I will be in the midst of newborn boot camp, however, I know my you will appreciate a little home tour eye candy in my absence. Who doesn't love looking at beautifully decorated and staged homes? There will also be a linky party on the last day of the tour for the rest of you to link up your home tour too! Looking forward to seeing every one's beautiful homes!!! This looks like a great line-up - can't wait to see! Can't wait to see the Parade of Homes and your sweet little one! Glad to hear you are well! Enjoy the journey :) I am so excited for you! Congrats on your last day!!! No way Ohio State is going that far! :o) (teasing!) We've been watching lots of basketball here too...so much fun! Sending happy thoughts along for baby!! Congrats on your new journey. Can't wait to hear when he decides to make an appearance. Congratulations! Looking forward to your announcement. What is a 31-Gifts Consultant? Stopping over from the blog hop! Congrats on your little one on the way! I hope your last days are filled with comfort!! I also love March Madness although this year my brackets have totally bombed, but I have enjoyed watching the games anyway! I'm a new follower :).